You'll recall Hale and Hearty recently blogged about the number of outlets bent on putting the Metro into metropolis, but here's an example closer to home. While we naturally take all due care not to imply any resemblance between this panini, sandwich and refillable hot beverage joint – on Moss Lane in Altrincham, opposite the ramp down to the station – and newspapers living or dead is anything other than coincidental, that font does look mighty familiar. 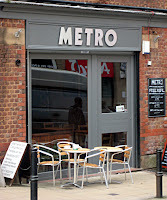 Cafe Metro: Eat well, live well!